A big thanks to all who attended the March Meetup and supported the fundraising efforts for SAINTS animal rescue/sanctuary. The grand total of money raised from treat sales, the raffle, t-shirt sales and a very generous donation (thanks Tom & Nadine!) was $720!! Awesome! Way to go Vancouver Shiba! With my husband Eric now working in Ontario, I am the sole person organizing the Shiba Meetups until I can join him. Due to the fact that I am ridiculously busy trying to organize the sale of my condo and making arrangements to move, there won't be a Meetup for April. However, there will still be a big event being held at the David Gray dog park in April and I would like to encourage as many Shibas and people to attend as possible. I'll be there with Koshi and Barkley for a couple of hours! 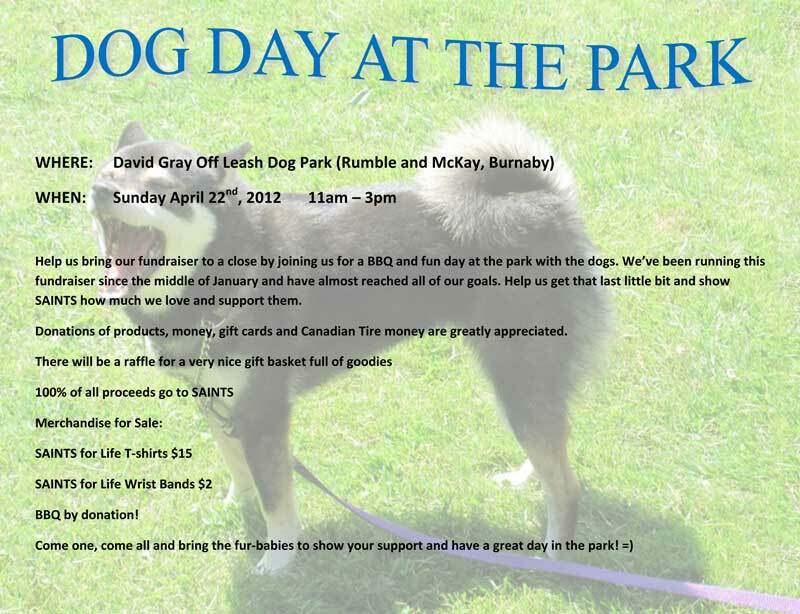 A friend and fellow animal lover – Burgundie – is hosting a "Dog Day at the Park" as her grand finale of three months of fundraising for SAINTS. There will be a BBQ by donation, beverages provided by Starbucks by donation, a raffle for a gift basket and much, much more! There will be a small number of SAINTS t-shirts available for sale as well. They are still accepting donations of gift cards (Rona, Staples, Canadian Tire etc. ), Canadian Tire money and cash. I have included the SAINTS wishlist if you would like to help out this amazing organization. If you can help, please bring your donations to the event! Hope to see you all there! It would mean a lot to me and the SAINTS crew to see all the Shibas representing! A big thanks to all who braved the rain for the February Meetup. We raised a total of $250 for Shiba rescue and donated it to NW Shibas4Life. Great job! I must apologize for the delay in getting this message out. I had hoped to announce the date of the next Meetup sooner but we received some unexpected news last week. Eric was offered and accepted a job in southern Ontario and will be leaving for Toronto on March 25th to begin his training. This will likely be his last Meetup. I'll be staying here for a few months to sell our condo, pack and plan the big move. I will do my best to have another Meetup or two before I leave. Eric and I have been organizing and running the Meetups going on 5 years now. During that time, Vancouver Shiba has raised over $17,000 for various animal charities and rescue organizations thanks to the efforts and generosity of our members. Thank you, members, for making a difference in the lives of animals in need! As this chapter in our lives draws to a close, there is a very special charity I would like to support and fundraise for at this Meetup. The organization that we will be raising money for is Senior Animals In Need Today Society – (SAINTS) located in Mission. They are an end-of-life sanctuary for senior and special needs animals that have no where else to go. SAINTS provides full medical care for these ailing and elderly animals and ensures that they live out their remaining days in comfort and peace. Many of their animals are adoptable and are looking for a loving home. Please consider adopting a senior animal! As this will be our last fundraiser at a Meetup, it's going to be a big one! 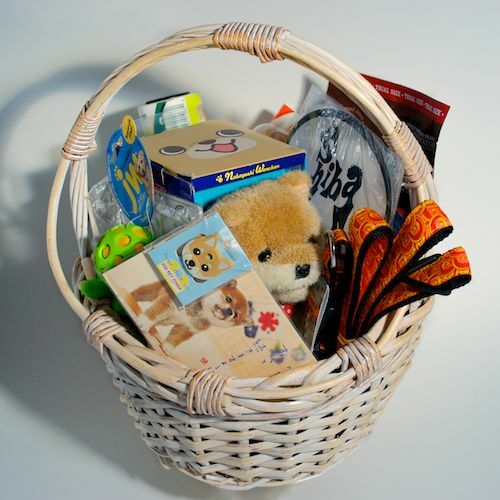 There will be another raffle for a gift basket with cool Shiba merch straight from Japan (there's a magazine with some hysterical photos!) as well as a few other Shiba items I still have leftover from my "buying everything Shiba related on eBay phase". A shout out to Bosley's in Yaletown for kindly providing many of the other items for the raffle. I will have liver brownies for sale and I'm planning on having a mini yard sale of new and gently used dog related items and a few household goods. I've listed a few of the items below. Prices to be determined but are completely negotiable! Burgundie, a friend and Shiba Meetup supporter has taken it upon herself to hold a massive fundraiser of her own for SAINTS. She's had a t-shirt designed as well as wristbands made. We are teaming up together at this Meetup and she will have a few shirts and wristbands available for sale. The shirts come in all sizes with many colours to choose from for $15. The wristbands are $2 each also available in several colours. Please contact Burgundie at tripweber@gmail.com for more info and/or to pre-order some SAINTS merchandise. She has also created a wish-list for SAINTS which I have included here. If you would like to help and maybe donate a few items on the list, bring them to the Meetup! Burgundie will be there to make sure it all goes to SAINTS. Please see the images of the wristbands and logo featured on the SAINTS t-shirt below. If you have a stash of Canadian Tire money gathering dust (like we do), consider donating it to this worthwhile charity! I will have a collection specifically for your Canadian Tire Money donations set up at the Meetup. Alright Vancouver Shiba members it's all in your hands and paws now! Please help Vancouver Shiba raise money for an animal charity that means a lot to us! As many of you are already aware, our own little Barkley is a special needs dog so the mission of an organization such as SAINTS is one we hold close to our hearts. This really is our last hurrah as the organizers of Vancouver Shiba. Please help us make it count! See you at the Meetup and don't forget to say your goodbyes to Eric! Here is an image of the Gift Basket that will be available at the February meet. All proceeds from the raffle will be donated to NW Shibas4life – So come on out and help Shiba Rescue while you're here.